We are happy to provide you with detailed information so you can make an intellect choice for your holiday party entertainment, just give Kim a call and she will be happy to help. Party KC that is more than just a local Disc Jockey Service in Kansas City. WE ARE ENTERTAINERS. We provide FUN & EXCITEMENT and many services for your holiday party. 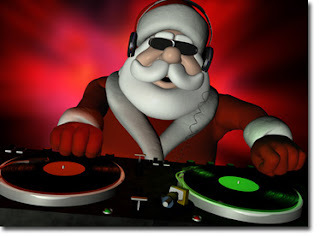 Your holiday party DJ in Kansas City will be the Master Of Ceremonies and make sure each activity at your events is performed according to your wishes. The entertainer that will be performing at your company holiday party will be the most professional DJ you have ever seen. He will dress and act appropriately to a corporate event, but he will also play the best music at the best time, and lead your event for maximum fun. He can also suggest many unique alternatives to the usual activities at the event. We can provide many other service like karaoke and group games. Family Fued is a great way to give out holiday gifts and prizes. In addition, we will play a wide selection of songs and holiday music to enhance your holiday party. Don't settle for a cheap and cheesy DJ, and don't hire someone out of a club and expect them to be appropriate in a business setting. Party KC has professional DJs ready to rock around your Christmas tree.